But yeah, on to what happened this week. I must say, the shows are actually doing a pretty solid job at selling themselves to me. Again, Side B has a hefty bunch of titles even without shows like March comes in like a Lion or Shôwa Genroku Rakugo Shinjû in them — so enough chit chat and let’s do this! 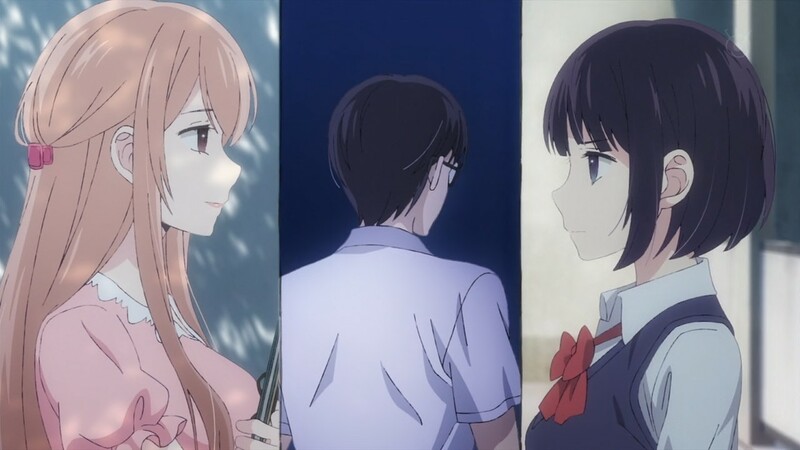 At first, I was actually a little let down by how this week’s episode of Scum’s Wish seemed to play down the reveal of Ecchan having feelings for Hanabi, preferring instead to focus on the repercussions of being an object of affection. But in retrospect, the episode actually had a lot of thematic coherence to it. It did a good job at highlighting Hanabi’s inherent cynicism as hypocritical — disregarding an anonymous boy’s affection and yet realizing the harshness of her philosophy on a friend who harbors the same emotions for her. She claims that it’s revolting to have to deal with someone’s emotions — especially if you’re not interested in that person. But her disregard for another person’s emotions makes her no different than the people she criticizes as treating love as a matter of “choosing the optimal candidate”. She realizes the arrogance of her rhetoric, and that her belief in the purity of her own experience of love is no better than that of the classmate she criticized, or Moca, or even Mugi. 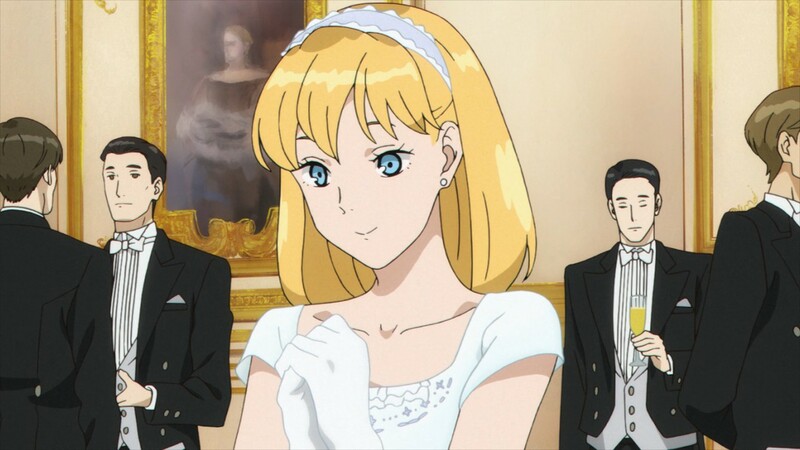 And speaking of Mugi, this burden of being an object of affection is again brought up when Mugi enters into a gratuitous relationship with a sexually-inclined upper classmate. In his case, the emotion this stirs up for him is fear — a fear of involvement and immersion that occurs when a person is striped bare before you. Although the show depicts this in a literal sense, the ramifications of this sexual encounter seeps deep into Mugi’s psyche, and causes him to prefer a more idealistic imagining of his own object of affection. His fear of involvement — knowing what his true love is like — gives form to the reason why he unwittingly manipulates Hanabi into engaging with him in sexual acts. That by doing so, he cannot taint the image he has painted of Akane-sensei — he refuses to envision her as promiscuous despite knowing that the boy she was seen with was a former student. However, Hanabi catches on to this early on, which brings us to the third depiction of a character’s response to being an object of affection in this episode. In Akane-sensei’s case, that would be manipulation. It’s a very strong accusation against a figure of respect, and the show’s boldness extends beyond the simple depiction of a teacher behaving badly. It goes on to show a student actually hating one. Hanabi might be called out as being paranoid, but her inner dialogue is presented with such richness it lends to the overall rawness of the emotions she’s experiencing. And her feeling of liberation comes as a realization of how her own love for someone is now fueled by a seething rage against, of all people, a teacher. And this is where Scum’s Wish shows strength not only in artistic interpretation, but even in language. Hanabi uses the word Ken’o (嫌悪), which literally means “disgust”. Not only does she hate her, but she finds everything she is doing utterly repulsive. Such a clear depiction of hate being the motivation that pushes her love interest is a very bold decision for the show to make, and the overall execution of this entire episode is just astounding. Although I will admit, this show will probably be very polarizing for some. The music seems hit or miss in this episode — either being overly dramatic or getting JUST the right beats in to heighten the emotional tension. The themes are also rather bold and controversial — but I think it has a very strong thematic cohesion that makes its overall premise both poignant and believable. I must say, I’m very, very impressed by this show! But seriously, there’s a lot to love about this show. I’m really impressed at how well it expanded its worldview in the third episode, and how the effective use of framing and dialogue actually makes the entire world inherently dubious. There’s so much speculation as to what the Coup d’état means to the people of Dowa, and how everyone is simply doubting one another. Jean is definitely being setup by someone, and the number of people tailing him in order to zero in on the rebels makes everyone’s approach to Jean similarly dubious. And I think this makes for a very intriguing story in that the tension arises not as a result of any action clips or mind-bending feats of logic; rather, there’s a dramatic tension that comes about due to the speculation that’s building up. It’s very, very difficult to achieve something that is convincing enough to make you even doubt the protagonist. And overall, I think this makes for a very high re-watch value for ACCA, having to look for small clues that actually point towards the bigger picture early on. I’m really psyched for this show at this point, and I really hope that it will continue to build up tension and deliver a satisfying reveal. This is a very ambitious title, no doubt, but I honestly think this is going to be good. It has to be. There were a lot of cartoony antics in this episode that would not have worked if not for the brilliant animation feats of Trigger Studios. This episode featured the classic “race” motif, in which the neophyte Akko attempts to join a flying broom relay race just because her idol had done so (and won) in the past. 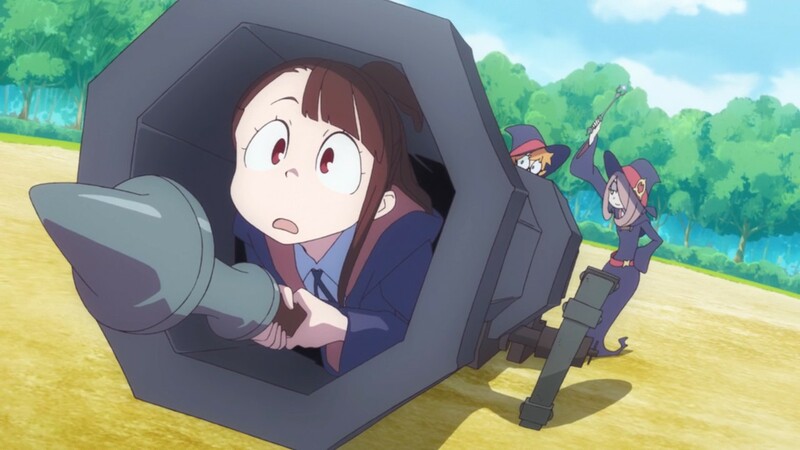 Obviously, Akko‘s non-witch background means she can’t fly a broomstick for the life of her, making for some silly segments that play around with the idea — like firing her out of a cannon in order to give her some “momentum”. But this otherwise basic plot flow is pregnant with inventive animations and highly immersive visual feats. What you lack in premise is made up for with overall execution — and Little Witch Academia nails it with beautiful segments accompanied with wonderfully magical-sounding melodies. The end of the episode celebrates the underdog at its finest, highlighting the importance of passion over simple victory. It’s not enough that you win for the sake of winning; rather, you triumph against the limitations that are imposed by not just others, but yourself, as well. Again, very classic lessons, but always something important to remember every now and then — especially when presented in as fantastic a manner as Little Witch Academia. 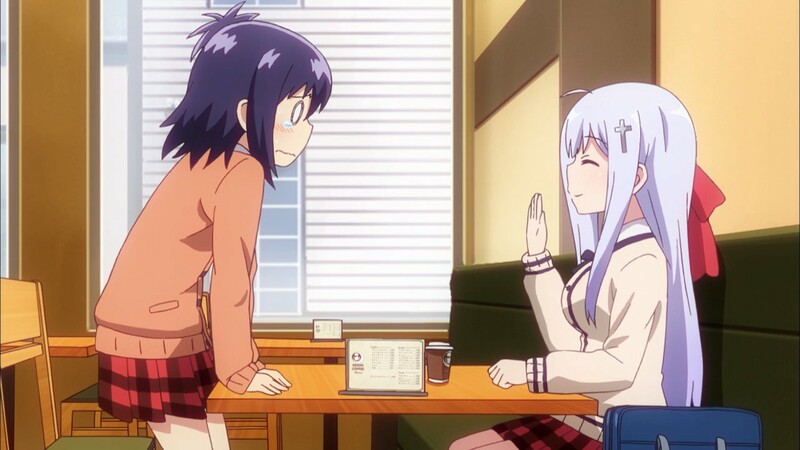 We’re finally starting to see a bit more variety to Gabriel DropOut come the third episode, and much of this was achieved by placing Garbriel in a different setup with a self-conscious, overly considerate café owner. The segment is both simplistic yet refreshing given the way the owner reacts to Gabriel’s curt attitude. It’s a refreshing change of pace that even allows characters like Satania and Vigne to create interesting situations, as is seen later in the same episode. But what really sold me was how they allowed for a different pairing of Raphiel and Vigne, with gags that are actually more amusing compared to the two-beat antics of just Raphiel and Satania. And what drives the gags further is Doga Koba’s effective use of varied animation, like the use of bolded character outlines and manga-esque shading lines to depict the intensity of Vigne’s dilemma to pick out the creampuff without the spicy filling in it. And to top off the segment was a smart call-back to last episode’s gag where Raphiel’s plans of getting Satania to eat the fiery creampuff is foiled when she eats it unfazed. It’s fun to see Satania unknowingly outwit Raphiel, and seeing the latter’s frustration makes for a refreshing change of pace to the otherwise stale comedy that plagued the series in the last two episodes. And lastly, I just have to mention the holy light gag. It’s a bit tasteless, but it’s fun to see how the show uses its setup to actually justify obnoxious censorship. Also, what probably sells this scene is how they DON’T make Vigne react all scandalized (which would only heighten the self-gratifying nature of the fan service), and instead chose to make her act confused as to where the holy light is coming from. And then, of course, there’s Gabriel’s attitude that simply brushes off the censorship as “expected”. It was a smart choice of execution for an otherwise tasteless joke. I give them credit for that. So yeah, I was pretty impressed with this episode, and that means I think I’m gonna keep it on board for a while. I hope the show expands more on the use of its characters, allowing them to bounce of each other in ways that go beyond the obvious angels doing bad things, devils doing good things shtick. I’m not exactly sure what happened in this episode. 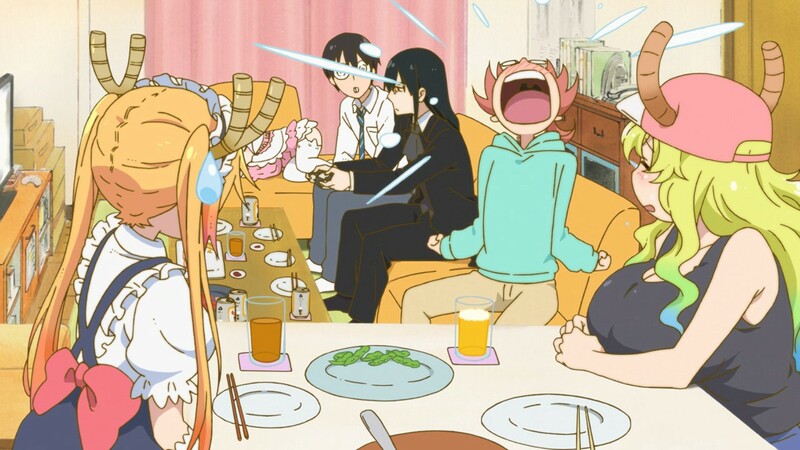 Kobayashi decides to rent out a larger apartment in order to house her dragon maid and freeloading loli dragon, and then there’s a segment about dealing with neighbors, before going into a bit where they have a party at her place with two more dragon characters; one ends up getting addicted to video games whilst the other displays a grotesquely huge rack. Then there are segments of downtime that highlight the bubbling relationship of Kobayashi and Tohru, as well as Tohru‘s general understanding of human beings and how this relates to her loving Kobayashi. I just feel like this show is trying to do something but is getting lost with how best to achieve these goals. On the one hand it’s trying to build a narrative, but on the other, it’s throwing in comedic quips with the (probable) intent of building characterization. At this point, it feels like a mess of ideas with an assumption of thematic depth. But honestly, I could be totally wrong — maybe there IS depth to this show. But this episode seemed to stagger between meaningful reveals and pointless banter. This is one confusing show and somewhat tiresome to have to analyze. But that doesn’t mean I didn’t enjoy watching this episode. In the end it was still fun — pointless, but fun. Whew, I had a lot to say this week. I honestly want to get to writing some editorials, so hopefully I can have something out for next week. Wish me luck. Until next time, ciao! Really liking this format you’ve started using last week! Sounds like I’m really missing out on ACCA. Will have to catch up on it soon. Thanks for sharing your elaborate and insightful thoughts as usual! Yeah, I’m finding it a little more manageable after breaking it up into two parts. I also get to share a bit more than I used to. Both pluses! It’s a bit more work considering that you have to write two posts now, but it seems to be worth it. Pingback: Atsuko Kagari – onamae wa? | kyra desu yo!